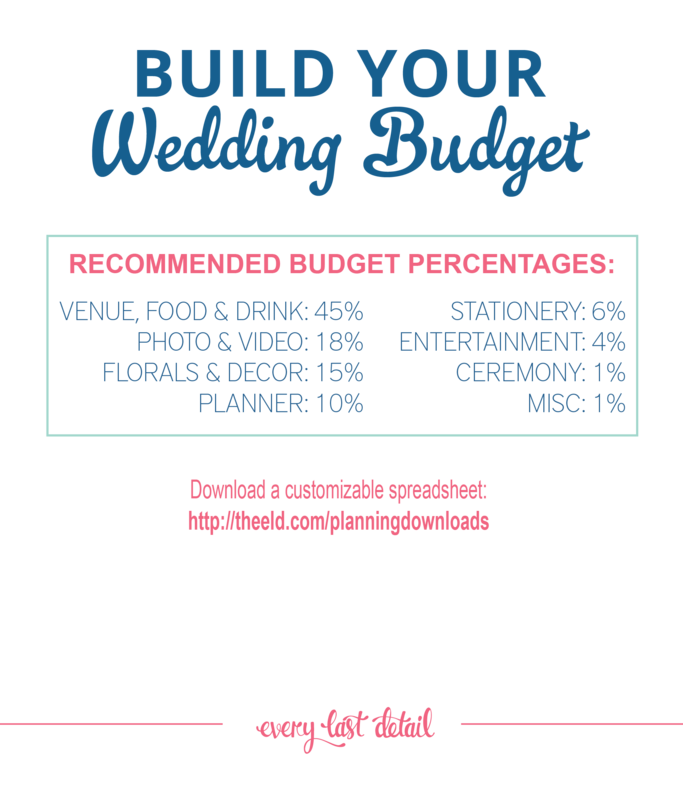 Wedding budgets are THE most important aspect of a wedding. Of course your marriage is the most important aspect, but when we’re talking about wedding planning, it’s your budget that gets the place of honor. One would think that it would be easy to create a wedding budget, but it’s something that there isn’t any kind of “set” formula for, so it’s a bit of “unknown territory”. Heck, all of wedding planning is unknown territory if you’re at the point of creating your budget! It’s important during all of this to keep in mind that your wedding budget is going to be unique to YOU- after all, it’s YOUR wedding, and YOUR preferences. 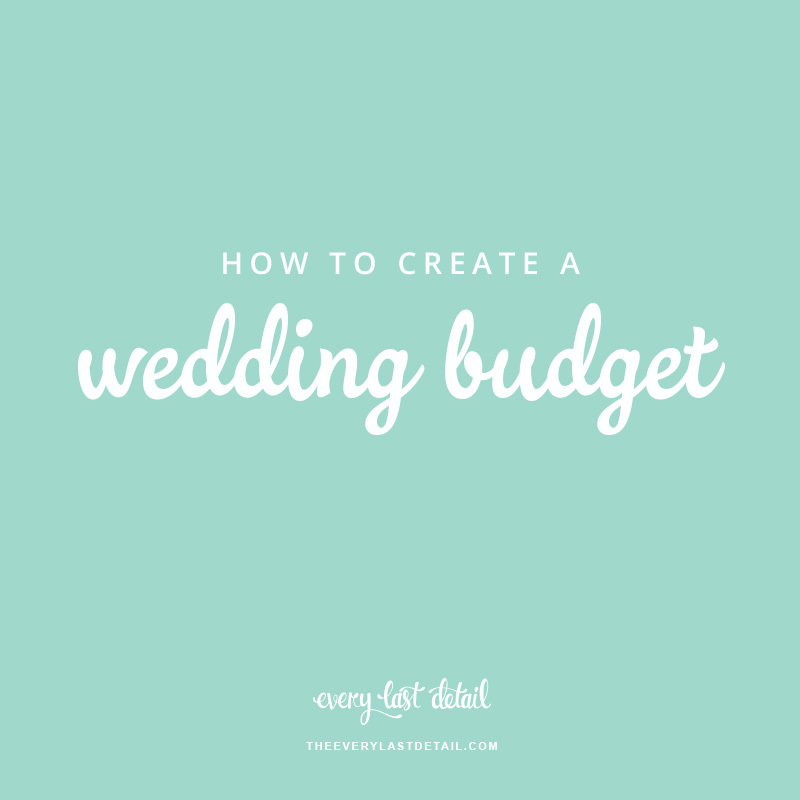 But there are definitely some guidelines and steps that you can follow when creating your wedding budget, and that’s what I’m sharing with you all today! Creating your budget is not something that is going to take days- you can really and truly sit down and do it in an hour or so. I recommend definitely sitting down with those who are contributing to your wedding budget and going through these steps together. When it comes to creating a wedding budget, it’s really just a few decisions that need to be made, all of where are contingent on one another and essentially need to be decided upon at the same time. …because you’ve never planned a wedding before, so you should absolutely be doing your research! …because you need to have some kind of wedding envisioned to budget properly! …because as much as you want to avoid it, you’re going to have to discuss financials to figure out how much will be contributed. …because the one thing that has the BIGGEST effect on your wedding budget is your GUEST COUNT! …because once you’ve covered all of the previous things mentioned, you can get to creating your budget! First things first, you MUST do some research on weddings themselves. I’ve found that it’s a lot easier to create your budget if you know what you should expect and are prepared right from the get-go. Sure, there’s the “average wedding” data out there, but the problem with that is the data has such a HUGE range when it comes to the weddings they are surveying. The majority of the time, brides themselves are being surveyed on what they spent for their wedding- heck, I’ve filled out a survey or two myself! But the thing is, these “weddings” are ranging anywhere from $2,000 to hundreds of thousands of dollars. Now I don’t know about you, but to me, that doesn’t seem like the most accurate data to base your wedding expectations on. Since I’m a proponent of brides using professionals for their weddings, I decided that I wanted to hear from the PROFESSIONALS what their prices were. Because really and truly- have you EVER purchased something without at least either looking it up online or looking at the price tag first? If you do a little math, you will see that all of these figures combine to add up to just under $50,000 for an average of 140 guests. 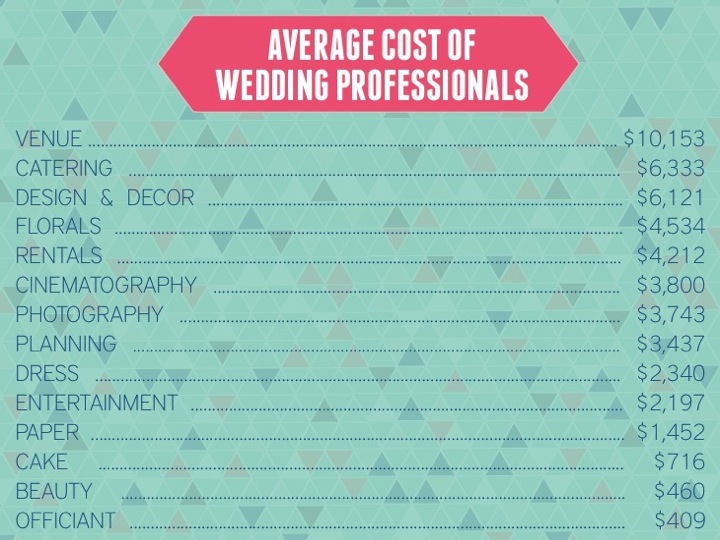 Now this doesn’t mean that you have to spend all of the same amounts for each vendor category of your own wedding, but it at least gives you an idea for what it might cost to work with an experienced professional. Having this information will give you a starting point so you can then customize your wedding budget to your wedding and your preferences. 1) Wedding PROFESSIONALS. These people are skilled professionals with tons of experience. This is their livelihood. They do it full time, and it’s what puts food on their tables, just as your job puts food on YOUR table. 2) Products. Rentals, purchases, food, alcohol, flowers, linens, etc etc. All of these products play a key part in a wedding, and they unfortunately don’t just materialize out of thin air. They have to be paid for! 3) Guests. The more guests you have, the more money you’ll have to spend. (This won’t be the first time I say this!) It’s more food, drinks, tables, linens, centerpieces, etc etc. And it’s something that YOU can have control over. If you don’t want to spend much on your wedding- keep it small. That is the key! For more on this topic, click HERE to read a full post on it! You get what you pay for! Paying for quality and experience will be something you won’t regret! Okay, now that you’re armed with this information, you can move on to the next steps of creating your wedding budget! Now I’m going to do something a little out of the norm and suggest that you start off by thinking about the type of wedding that you want. It doesn’t have to be anything set in stone like colors and decor, but more along the lines of the style and feel. Do you want it to be casual, relaxed, and fun? Or do you want it to be elegant, chic, and romantic? Outdoors or indoors? A farm wedding, or a ballroom wedding? All fairly broad things, but also very important things that will help you in creating your wedding budget. I know, this is what everyone dreads. But you HAVE to do it so you can determine who will be contributing to your wedding. Will it be just you and your fiance? Just your parents? Or maybe a combination of you and your fiance, your parents, and your fiance’s parents? Every family is different, so don’t feel like you have to do anything in any particular way. In your discussion, you may talk about specifics for what each party can contribute, or you may not. We all know that money can be a touchy subject and everyone approaches it differently. It may even be helpful to create a few example scenarios to figure out how much you might need. If you’re going the traditional route, your (the bride) parents would pay for the wedding reception, and the groom’s parents would pay for the rehearsal dinner (groom’s parents also sometimes pay for the alcohol at the wedding). However, today it’s pretty common for multiple people to contribute- such as the bride and groom’s parents, as well as the bride and groom themselves. It’s also not uncommon for the bride and groom to pay for the “extra” costs of vendors or things that mean a lot to them- like a super amazing photographer, or a planner to keep them sane. Plus, since many couples are getting married later in life (aka once they are successful and have established careers), it’s becoming a norm for the bride and groom to pay for their own wedding. There’s really no right or wrong way in deciding who contributes to your wedding budget though. It’s all about whatever works best for you, your family, and your wedding. Once you know who will be contributing to your wedding budget and how much they can contribute, you can add it all up and set your total wedding budget! *PRIORITIES: It’s really important to also discuss what your priorities are, if you have any. If amazing food is the one thing that you and your fiance care about, you’ll want make sure you have a great budget for that. Be prepared to make some cuts to other areas within your budget order to accommodate your priorities. Decide what things are most important to you, and then move on to the next step! Next, you need to know how many guests you can expect. Your guest count is THE most important part of your wedding budget, because just about everything for your wedding is directly related to the number of guests. Food and beverage are a big cost, as are rentals. If you want to keep your budget small, then you need to keep your guest list small too! Sit down with your fiancé and start your guest list. Ask parents and those contributing to your wedding budget. Once you have your list that will be considered your MAXIMUM. Usually about 30% of guests will RSVP no to a wedding, so you can then consider your guest count to be 30% less of the number of guests you have on your list. I also recommend taking a good look at your list to determine who you would absolutely *have* to have at your wedding, and who you could do without- and use that to cut your list a little more and create an A list and B list. 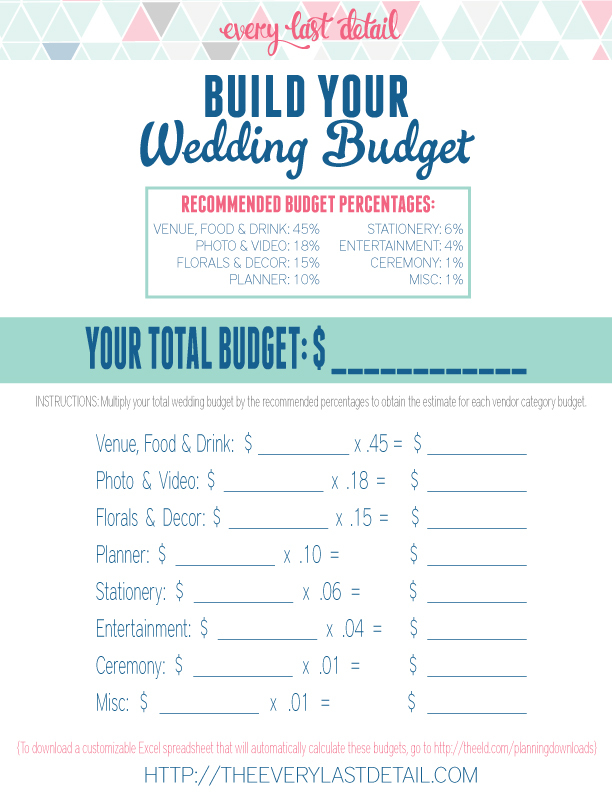 Once you have the previous decisions made, you can actually CREATE your wedding budget! The typical method of creating a wedding budget would be known as the “Top-Down” method, in which you set your total cost, and then divide up your budget from there. You can use specific percentages to help determine your budget for each vendor category. The following percentages are what I recommend to use as a basis. They’re a little different from other resources’ recommendations, but based on my experience as both a bride and wedding planner, they’re much more realistic (if you’re planning on working with professionals)! Now as you can see, the reception (which includes venue, food, and drink) takes up almost half of your wedding budget. This is why your guest count is so important- it can make your wedding budget or break it! Note: The dress is not included in the above percentage recommendations due to the fact that often times it is considered as a separate cost from the full wedding budget, plus there is such a varied price range for dresses depending on your taste and style. If you do include it as part of your full budget, then just add it in accordingly and remove some percentage from another category to accommodate. I also have a spreadsheet here on ELD that has formulas for all of the percentages and makes customizing your budget really easy to do. Go to TheELD.com/planningdownloads to download it! Another method for creating your budget is known as the “Bottom-up” method. This works well if you have one or two costs and use the “percentages” for those costs to determine the rest of the budget. This would be a good method to use if you have already received an estimate from a vendor or two. You can use those figures to help you figure out the rest of your budget. For example: you have already received an estimate for $20,000 for venue, food, and beverage. The $20,000 divided by 45% would equal to $44,444, and you can use that figure to help you set the rest of your vendor budgets. Once you’ve started working on the numbers, you can start really customizing your budget to what is important to you. Do this by pulling from other categories to accommodate your priorities- the spreadsheet I have here on ELD makes this pretty easy to do. For example… if you want to make sure you have an awesome photographer, you can pull from one category to add more money to the photographer category. Just remember to always make sure your percentages add up to 100%! DONE! Now you have your wedding budget! Now after doing all of these and making a few decisions, you should have your wedding budget! Remember- your wedding budget is the foundation of your whole wedding. Only good things can come of having a budget in place! This is a great great resource. Going to send to one of my new clients who recently got engaged! What great information! I want to share this with our followers but I did not see in the breakdown a percentage for clothing and beauty (hair, make up, etc). Does that fall in to one of the existing categories? Thanks!